within Human Matrin 3. The exact sequence is proprietary. HEK293T, K562, HeLa and HepG2 whole cell lysate (ab7900); Human brain tissue, Human colon tissue and Human breast carcinoma tissue; Mouse and rat liver tissue, Mouse and Rat brain tissue lysate. Our Abpromise guarantee covers the use of ab151714 in the following tested applications. WB 1/10000 - 1/50000. Predicted molecular weight: 95 kDa. May play a role in transcription or may interact with other nuclear matrix proteins to form the internal fibrogranular network. In association with the SFPQ-NONO heteromer may play a role in nuclear retention of defective RNAs. Defects in MATR3 are the cause of myopathy distal type 2 (MPD2) [MIM:606070]; also called vocal cord and pharyngeal dysfunction with distal myopathy (VCPDM). MPD2 is a muscular disorder characterized by distal weakness, with onset in hands and feet, associated with vocal cord and pharyngeal weakness causing a nasal voice and swallowing disorders. Immunohistochemical analysis of paraffin-embedded human colon tissue sections labeling Matrin 3 with purified ab151714 at a dilution of 1/2000 (0.7 μg/ml). ab97051 Goat Anti-Rabbit IgG H&L (HRP) at 1/500 was used as the secondary anitbody. Sections were counterstained with hematoxylin. Antigen retrieval was heat mediated using citrate Buffer, pH 6.0. PBS was used instead of the primary antibody as the negative control and is shown in the inset. Immunocytochemistry/Immunofluorescence analysis of HeLa (Human epithelial cell line from cervix adenocarcinoma) cells labeling Matrin 3 with purified ab151714 at 1/500. Cells were fixed with 4% Paraformaldehyde and permeabilised with 0.1% tritonX-100. 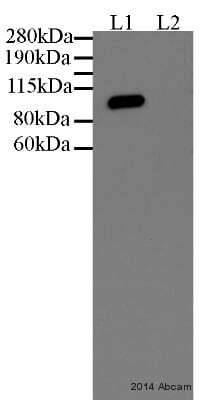 ab150077, Alexa Fluor® 488-conjugated goat anti-rabbit IgG (1/1000) was used as the secondary antibody. 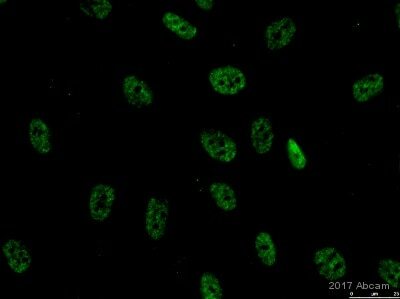 Cells were counter-stained with ab195889 Anti-Alpha Tubulin antibody [DM1A] (1/200, 2.5 μg/mL) - Microtubule Marker (Alexa Fluor® 594) at 1/200. DAPI (blue) was used as a nuclear counterstain. Secondary Only Control: PBS was used instead of the primary antibody as the negative control. Immunohistochemical analysis of Paraffin-embedded rat liver tissue sections labeling Matrin 3 with purified ab151714 at a dilution of 1/2000 (0.7 μg/ml). ab97051 Goat Anti-Rabbit IgG H&L (HRP) at 1/500 was used as the secondary anitbody. Sections were counterstained with hematoxylin. Antigen retrieval was heat mediated using citrate Buffer, pH 6.0. PBS was used instead of the primary antibody as the negative control and is shown in the inset. Immunohistochemical analysis of paraffin-embedded mouse liver tissue sections labeling Matrin 3 with purified ab151714 at a dilution of 1/2000 (0.7 μg/ml). ab97051 Goat Anti-Rabbit IgG H&L (HRP) at 1/500 was used as the secondary anitbody. Sections were counterstained with hematoxylin. Antigen retrieval was heat mediated using citrate Buffer, pH 6.0. PBS was used instead of the primary antibody as the negative control and is shown in the inset. Flow cytometry analysis of 4% paraformaldehyde fixed HepG2 (human hepatocellular carcinoma) cells labeling Matrin 3 with purified ab151714 at a dilution of 1/220. 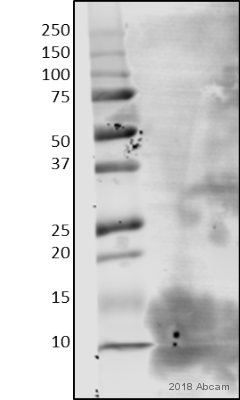 A goat anti rabbit IgG (Alexa Fluor® 488) at a dilution of 1/2000 was used as the secondary antibody. Immunohistochemical analysis of paraffin-embedded Human brain tissue labeling Matrin 3 with unpurified ab151714 at 1/250 dilution. Immunohistochemical analysis of paraffin-embedded Human breast carcinoma tissue labeling Matrin 3 with unpurified ab151714 at 1/250 dilution. Immunofluorescent analysis of HepG2 cells labeling Matrin 3 with unpurified ab151714 at 1/250 dilution. Immunohistochemical analysis of paraffin embedded normal Human uterus tissue using unpurified ab151714 showing +ve staining. Immunohistochemical analysis of paraffin embedded Human Ovarian carcinoma tissue using unpurified ab151714 showing +ve staining. Immunohistochemical analysis of paraffin embedded Human Lung carcinoma tissue using unpurified ab151714 showing +ve staining. Publishing research using ab151714? Please let us know so that we can cite the reference in this datasheet.